The Pipe organ at St Mary and Giles Church, Stony Stratford is a 3 manual Henry Willis, which came from the Church of St George in Edinburgh (now a register archive office) and was installed in our Church from 1967-1969. It plays an important part in our worship every week and is also used regularly for rehearsals of the Parish Singers, concerts, recitals, weddings and funerals. 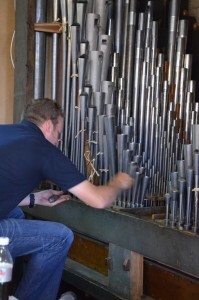 Pipe organs need major refurbishment every 25 – 30 years because leathers perish and some moving parts wear out. Our organ has been maintained over the years and has had some parts replaced, now at last, after 10 years of fundraising and a generous grant from the Heritage Lottery Fund, the organ has been restored and the intended Willis III specification of 1932 completed. The instrument now has great potential as a recital or teaching instrument. It has a wide range of stops providing rich tone and colour. FH Browne & Sons of Kent completed the restoration work in December 2015. 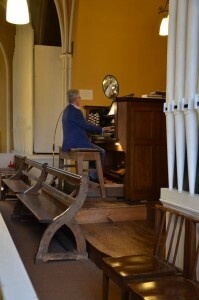 Before restoration work commenced in July 2014, it was used for recitals, but the action was increasingly unreliable so although it was used for regular teaching and as a practice instrument by several young organ scholars, its unreliability limited all players from realizing its full potential. 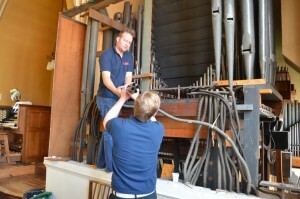 You can find out more about the history of this pipe organ in the Organ History section.